Abstract: Suitable physics-based surrogates can facilitate effective engineering design optimizations with high-fidelity or “fine-model” simulation accuracy and “coarse-model” simulation speed. So-called space mapping exploits the engineer’s traditional “quasi-global” intuition. It specifically implements the iterative enhancement of suitable physics-based surrogates derived from simple mappings of coarse models (the “less”) to realize highly accurate surrogates of corresponding fine models (the “more”). Importantly, space mapping offers a quantitative explanation for the engineer’s mysterious “feel” for a problem. This talk recalls how the concept came into being, as well as how it differs from other surrogate-based approaches that found favor at much the same time. The essential difference (oversimplified here for the sake of discussion) is that space mapping arises out of an understanding of the “feel” that an experienced engineer has for a complex engineering design problem, while the generic surrogate-based approach arises from the “feel” that a mathematician has for a generic optimization problem. Confusion sets in when words like surrogate, model, and simulation are used arbitrarily and interchangeably to mean almost any representation of anything. One thing is for sure: surrogates, models, and simulations imply underlying knowledge, nowadays typically the physics embodied in a simulator. How this knowledge is actually manipulated—from the “inside” or from the “outside”—depends on whether the designer is oriented towards engineering or mathematics (or perhaps both). Abstract: Damage identification is a wide ranging and pressing issue in applications ranging from civil infrastructure to aerospace and renewable energy. At its heart is an inverse problem - given a new observation of the behaviour if the structure can we identify whether it is damaged? And, if so, can we say where, in what fashion and to how great an extent? Approaches to this task are often viewed as falling into one of two categories: either a law-based approach is adopted, with an initial numerical model ‘updated’ using newly acquired data in order to infer damage; or a purely data-based approach is pursued, whereby experimental observations alone are used to construct a statistical model for damage inference. Both approaches have their drawbacks: the former can be computationally expensive and susceptible to both systematic bias and uncertainty, while the latter is typically only valid for experimental data that has already been ‘seen’. Several of these issues may be overcome by replacing the inverse numerical modelling task with a series of forward problems, and using emulation techniques to alleviate the computational burden involved. The topic of this talk is a discussion of the ways in which Gaussian process emulation may be adopted to aid the practical implementation of such an approach. Abstract: Structural and aerodynamic analysis have always acted separately with one’s results being fed to the other through a drawn out design process. Technology now allows us to use programs such as Microsoft Excel, Visual Basic and Matlab to write command files for these analyses software so to achieve a design process with minimal user input and much more efficient design loop iterations. This project involves using the afore mentioned software to do just that. The problem is the design of a component used during the thrust reversal of an aircraft during its landing phase. The process proposed in this talk is robust enough that it is, in essence, a software architecture that can be applied to any multidisciplinary design problem. After the process for multidisciplinary analysis has been built and the stress and fluids models validated against experiments, sample points of the design space can be analyzed and a surrogate model built. The surrogate model can then act as a pre-design tool allowing the capability of quick exploration of the design space by changing the design variables (customer requirements) to create optimized configurations and therefore decision making. stiffeners) of structural components in order to calculate mechanical strength criteria and their sensitivities, depending on current internal loads. An optimization step is then performed from combined global-local sensitivities. This bi-level global-local optimization process is then repeated until convergence of load distribution in the whole structure. Numerous calculations of mechanical strength criteria are necessary for local analyzes, resulting in great increase of the time between two iterations. In this work an effective method for speeding up the optimization process was proposed. The method uses surrogate models of optimization constraints (mechanical strength criteria) and provides a reduction of structure optimization computational time from several days to a few hours. Abstract: While optimization is a frequent goal for surrogate models, another application area where we employ surrogate models is computational steering. In such a scenario, the user performs interactive (visual) exploration of expensive complex simulations with the purpose of identifying parameter dependencies, correlations or overall behavior of the considered PDE. The key requirement of surrogate models thus becomes the response time, namely, how fast can the model return surrogates for new parameters of a high resolution three-dimensional simulation. We describe an approach that uses sparse grids as cheap non-intrusive surrogate models in order to achieve high interactivity (milliseconds) for smooth exploration and which scales both with respect to the number of snapshots and snapshot resolution. To construct the function representation, the oine phase requires certain snapshots of the considered PDE and is oblivious to its characteristics, while the online phase is reduced to a scalar times vector multiplication followed by a vector fan-in summation, operations for which we use a CPU-GPU setup for high eciency. We introduce also a "level-of-accuracy" technique to deliver incremental surrogates and thus satisfy the interactivity requirement even for really large resolutions and snapshot count. We present results of the use of sparse-grid-based surrogate models for high resolution CFD, heat-dissipation, and multiphase flow simulations. H.-J. Bungartz and M. Griebel. Sparse grids. Acta Numerica, 13:147-269, 2004. Abstract: Electromagnetics (EM) accuracy and circuit-design speed can be achieved simultaneously through a tuning space mapping approach. Tuning space mapping is based on the intuitive idea of “space mapping” and an EM-simulator-based tuning methodology. We briefly review the state of the art of computer-based optimal tuning of microwave circuits. We explain the art of microwave design optimization through our “tuning space mapping” procedures. These procedures involve various distinct types (e.g., Type 1 and Type 0) of so-called auxiliary fine model (fine model with tuning ports) and tuning models (auxiliary fine models augmented with tunable or tuning elements). We demonstrate the implementation of these sets of models through simple examples. We provide application examples utilizing commercial simulation software. Our purpose is to help engineers at large understand tuning space mapping methodology and to inspire new implementations and applications. Abstract: This talk presents surrogate modeling as a solution to circuit design in the presence of PVTA – Process Variations, Temperature and Aging. With large variations and strong aging effects in sub-90 nm analog designs, it is necessary to add considerable calibration overhead to circuits so as to cope with these effects. The design question then becomes where to add calibration and how much to add? This talk presents a general strategy and specific case studies of how to design a circuit with sufficient calibration to cope with PVTA. This paper presents a solution strategy that relies on surrogate modelling as an intermediate step in design. The modelling builds on the SUMO toolbox with specific interfaces to appropriate Spice tools. Abstract: In the automotive industry shorter development cycles and a reduced number of prototypes lead to an increasing demand for efficient and reliable modelling tools for transient calibration purposes of combustion engines. The fundamental requirement for an integrated methodology for the complete model based calibration process is that the experiment on the testbed as well as the model structure are designed in a way that the model is able to cover all relevant effects. Such models will then allow to apply the parameter variations for dynamic calibration to a virtual plant instead of the real plant. The present contribution describes a new approach for combustion engine model identification for transient calibration purposes. The proposed modelling concept is based on a split of the engine process into several local operating regimes, represented by the dominant influence of load and speed. This strategy allows to overcome the highly nonlinear dynamic complexity of the engine. In the second step each operating regime is identified by one dynamic local model network with a certain number of local linear models. Finally, the global nonlinear dynamic model is formed by weighted aggregation of the local dynamic nonlinear models. Thus, the underlying model structure combines physical knowledge and experimental models. The split of the engine process using prior knowledge allows to build a model with locally different complexity. The main advantages of the operating regime model are its effectiveness when dealing with different noise levels or sensitivities in different operating regimes and the ability to dramatically reduce the complexity of the experiment design, especially when a multiplicity of constraints (e.g. in terms of engine protection) has to be taken into account. A second important factor is that operating regime models can handle the situation where some inputs are only active or available in a certain operational condition (in a certain operating area), where conventional strategies would result in ill-conditioned parameter estimates. The proposed operating regime model with physical a priori information embedded in its structure provides excellent generalisation properties and the real-time application in an HiL environment has been realised in the course of this work. The benefits of the proposed concepts are demonstrated by means of real measurement data from a state-of-the-art diesel engine. Abstract: Design centering problem seeks for nominal values of system designable parameters that maximize the parametric yield. A new method for design centering and feasible region approximation is introduced. The method has a statistical-geometrical nature, and exploits Semidefinite programming and space mapping surrogates to approximate the feasible region with two bounding ellipsoids. These ellipsoids are obtained using a two-phase algorithm. In the first phase, the minimum volume ellipsoid enclosing the feasible region is obtained. Space mapping surrogate approximations to the feasible region are updated iteratively and a convergent sequence of increasing-volume Löwner-John ellipsoids is generated for each region approximation. The generated ellipsoids enclose tightly selected sets of feasible points out of generated sample points. In the second phase, the largest ellipsoid that can be inscribed within the feasible region is obtained. This ellipsoid is obtained through updating a sequence of polytopic approximations iteratively to the final space mapping feasible region approximation and finding the largest ellipsoid that can be inscribed within each polytope. The centers of the two bounding ellipsoids are used as design centers. In the second phase, an additional polytopic region approximation is obtained. Numerical and practical examples are considered to show the effectiveness of the new method. Abstract: Particle swarm optimization has been popular, but it has fundamental weakness such as premature convergence. In this paper, we analyze its cause and try to combine PSO with artificial immune system (AIS). The proposed approach can improve the convergence rate and accuracy by providing better diversity in solutions and introducing more efficient immune operators. After reviewing the current status of PSO and immune systems, we investigate the improvement of PSO by introducing self-regulating characteristics and memory used in AIS into PSO to enhance PSO, and we also use vaccination and immune selection as well as information and knowledge of the problem, in combination with opposition-based learning for initial population. All these will ensure that premature convergence in PSO can be avoided effectively. In addition, we will also investigate the effect of clone operator and chaotic mutation on the diversity of the solution in PSO, which shows good improvements. Abstract: In this talk, we present several results from multi-objective industrial applications of our hierarchical metamodeling approach for optimization, which can be seen as an iterative process. The results will mostly be presented concentrating on the more general and transferable aspects of our solutions. Steps of the iterative process discussed include model evaluation, Pareto pre-optimization, model assessment and refinement by an expected improvement strategy. RBF-parameter adjustments or transition functions are used to integrate additional simulation results into a global model. In certain situations, clustering steps are a promising addition. Briefly, we will also present a qualitative comparison to alternative suggestions from the literature and discuss their applicability. Finally, we give a short outlook on our ongoing research and picture future applications of (hierarchical) metamodeling in combination with traditional model order reduction approaches. Abstract: In solving many engineering optimization problems, it is generally preferable to formulate several quantifiably good alternatives that provide very different approaches to the particular problem. This is because decision-making typically involves complex problems that are riddled with incompatible performance objectives and possess competing design requirements which are very difficult – if not impossible – to quantify and capture at the time that the supporting decision models are constructed. There are invariably unmodelled design issues, not apparent at the time of model construction, which can greatly impact the acceptability of the model’s solutions. Consequently, it is preferable to generate several alternatives that provide multiple, disparate perspectives to the problem. These alternatives should possess near-optimal objective measures with respect to all known modelled objective(s), but be fundamentally different from each other in terms of the system structures characterized by their decision variables. This solution approach is referred to as modelling to generate-alternatives (MGA). This study demonstrates how the biologically-inspired, Firefly Algorithm can be used to efficiently create multiple solution alternatives that both satisfy the required system performance criteria and yet are maximally different in their decision spaces. The efficacy and efficiency of this MGA approach is demonstrated using a number of case studies. Abstract: Adjustment of geometry and material parameters is an important step in the design of microwave devices and circuits. Nowadays, it is typically performed using high-fidelity electromagnetic (EM) simulations, which might be a challenging and time consuming process because accurate EM simulations are computationally expensive. In particular, design automation by employing an EM solver in an numerical optimization algorithm may be prohibitive. Recently, adjoint sensitivity techniques become available in commercial EM simulation software packages. This makes it possible to speed up the EM-driven design optimization process either by utilizing the sensitivity information in conventional, gradient-based algorithms or by combining it with surrogate-based approaches. In this paper, we review several recent methods and algorithms for microwave design optimization using adjoint sensitivity. We discuss advantages and disadvantages of these techniques and illustrate them through numerical examples. Abstract: The high computationally expense of electromagnetic simulations required in the yield estimation process and the difficulty of getting or estimating any gradient information, makes the statistical design centering and yield optimization of microwave circuits prohibitive. A novel approach for statistical design centering of microwave circuits is introduced. In the proposed approach, space mapping surrogates exploiting the generalized space mapping (GSM) technology is incorporated with the derivative-free trust region optimizer (NEWUOA: new unconstrained optimization algorithm). Additionally, the Latin Hypercube Sampling (LHS), as a variance reduction sampling technique, is implemented in the yield estimation process. Two techniques suitable for the microwave circuit statistical design centering, are introduced. The first technique exploits the surrogates that may be developed using any circuit optimizer in optimizing the yield. While the second technique constructs and updates a space mapping surrogate during the yield optimization process. Practical circuit examples are presented to show the efficiency of the new approach. Abstract: The simulation of electromagnetic systems has become more and more important in recent years. Virtual prototyping has become a widespread technique in the development process of many products. This presentation deals with optimization challenges that arise when the goal functional is based on the numerical solution of a coupled electromagnetic system, taking into account some effects of multi physics. A 3D filter model, simulated by a frequency domain solver, is first optimized using a Minimax optimization method to reach the specifications defined on the S-Parameters. The algorithm is embedded in a trust region framework to ensure convergence and exploits automatically generated sensitivities for the calculated S-Parameters. The achieved optimum is then used as starting point for an even more realistic optimization with the same algorithm taking into account the deformed model which is calculated by applying the displacement field for the filter derived from the thermal loss at a certain frequency. This improved goal functional is based on the S-Parameters that are derived from a coupled simulation of a frequency domain electromagnetic solver, a thermal and a mechanical solver. Numerical results show that both optimizations converge within a few number of function evaluations because the integrated sensitivity information and the carefully chosen starting point of the second optimization reduce the computational effort. PDE-constrained optimization in which one aims at minimizing the discrepancy between measured and simulated data in an appropriate norm. The straighforward inclusion of a finite element resolution procedure in a derivative-free optimization is prohibitively expensive. The space-mapping technique is a family of surrogate-based optimization methods that aim at alleviating this bottleneck. The manifold-mapping technique in particular is an output space-mapping technique in which the mapping between the fine and coarse model is constructed in such a way to guarantee the converge the convergence to a (local) minimizer of the fine model.In this work we attempt to combine the manifold-mapping algorithm with adjoint sensitivity hoping to combine the best of both worlds. We envisage to arrive that an hybrid algorithm that is faster to convergence (due to the inclusion of gradient information) while at the same being able to escape from local minimizers (inclusion of coarse model information). Preliminary numerical results will illustrate some of the salient points discussed. Abstract: In this talk, I will summarize our recent activities in the field of surrogate modelling in large-scale optimal control problems. A first aspect is to employ an adaptive multilevel concept to reduce the order of the discrete optimization problem in such a way that most of the optimization iterations are performed on comparably cheap discretizations of the underlying PDEs. In a second approach, the concept of goal-oriented adaptivity is used to control discretization errors and a hierarchy of models during the optimization. Finally, I will focus on POD techniques for large eddy simulations. The different strategies will be demonstrated for real-life engineering optimization problems including three-dimensional glass cooling processes and optimal control of water and gas networks. Abstract: Aerodynamic shape optimization is of primary importance in the design of engineering systems and devices such as aircraft, turbomachinery, ships and propellers, and automotives. In this presentation, a computationally efficient optimization methodology for aerodynamic design using high-fidelity computational fluid dynamic (CFD) models is described. Direct optimization of an expensive high-fidelity CFD model is replaced by an iterative updating and re-optimization of a cheap surrogate model. The surrogate is constructed using the low-fidelity model which is based on the same governing fluid flow equations as the high-fidelity model, but uses coarser mesh resolution and relaxed convergence criteria. The low-fidelity model undergoes suitable corrections to become a reliable representation of the high-fidelity one so that it can be subsequently used to find an approximate optimum design of the latter. The corrections are implemented using space mapping. Our method is applied to constrained airfoil and wing lift maximization and drag minimization in transonic flow. To our knowledge, it is one of the first applications of space mapping to aerodynamic shape optimization. Abstract: Antenna design can be challenging and time consuming due to the lack of accurate analytical models for many modern types of antennas, e.g., dielectric resonator antennas, ultra-wideband antennas, planar Yagi antennas. For such antennas their reflection and radiation responses are typically obtained through electromagnetic (EM) simulation which can be of high computational costs. On the other hand antenna design can be realized as a simulation-driven optimization problem. Direct EM-based optimization of antennas, however, is impractical not only because of being CPU-intensive but also because it often fails due to poor analytical properties of the EM-based objective function. Many existing approaches exploit metaheuristic methods like genetic algorithms or particle swarm optimizers which are characterized by huge computational overhead. As a matter of fact, an antenna design practice is with multiple EM simulations and parameter sweeps, where the design parameters are iteratively modified based on experience of the engineer. Here, we discuss and demonstrate a number of rapid antenna design optimization techniques which can be also feasible for implementation. In these techniques the optimization burden is shifted to a surrogate model, computationally cheap representation of the optimized structure. Presented techniques include space mapping combined with functional approximation of the coarse-discretization simulation data, variable-fidelity multi-model algorithm, shape-preserving response prediction technique, and adaptive design specification technique. In all these techniques, fast and reliable surrogate models are configured from properly corrected and handled coarse-discretization simulation data. Considered approaches yield reliable designs at computational costs corresponding to a few full-wave simulations of the antenna in question. Abstract: Marine ecosystem models are of great importance for understanding the oceanic uptake of carbon dioxide and for projections of the marine ecosystem’s responses to climate change. The applicability of a marine ecosystem model for prognostic simulations crucially depends on its ability to resemble the actually observed physical and biogeochemical processes. An assessment of the quality of a given model is typically based on its calibration against observed quantities. This calibration or optimization process is intrinsically linked to an adjustment of typically poorly known model parameters. Straightforward calibration attempts by direct adjustment of the model parameters using conventional optimization algorithms are often tedious or even beyond the capabilities of modern computer power as they normally require a large number of simulations. This typically results in prohibitively high computational cost, particularly if already a single model evaluation involves time-consuming computer simulations. The optimization of coupled hydrodynamical marine ecosystem models simulating biogeochemical processes in the ocean is here a representative example. Computing times of hours up to several days already for a single model evaluation are not uncommon. This talk comprises an overview on investigated surrogate-based optimization methodologies seeking a computationally efficient optimization of marine ecosystem models. Abstract: Space Mapping optimization requires the use of a fast, or “coarse” model that allows approximate evaluation of the impact of changings in the underlying structure. Here we discuss a new way to synthesize a lumped model based on electromagnetic (EM) analysis data. A few EM analyses are performed for several different values of one or more parameters (e.g., line width, line length, etc. ), and an optimal lumped model is synthesized from the data for each EM analysis. The synthesis results in models that physically correspond to the structure of interest. Then, by restricting the synthesis to the same optimal model for each case of the EM analysis, a parameterized model for the values of each lumped model element is easily obtained. The resulting parameterized model of the complete lumped model is then used for optimization. Abstract: The synthesis of artificial transmission lines based on metamaterial concepts (i.e. using Complementary Split Ring Resonators -CSRRs-) is not a simple task, since several interrelated design parameters are typically involved. A brief review of the synthesis of these unit cells through the use of space mapping techniques is presented. The most critical points related to the implementation of such techniques, as well as their solution in order to obtain an automated design method, are also discussed in this talk. Abstract: Strong partitioned coupling algorithms for fluid-structure interaction are designed to efficiently minimize an interface residual in order to satisfy the kinematic and dynamic interface conditions on the fluid-structure interface as much as possible. The minimization can be performed using Newton´s method. However, Newton's method canno­­t be applied when the fluid and structure solvers are considered black-boxes since the Jacobian of the interface residual is not available. For this reason, Quasi-Newton methods were developed that approximate either the interface Jacobian or its inverse from input/output information only. In this contribution space-mapping is used to efficiently perform the minimization of the interface residual. The space-mapping technique exploits a computationally inexpensive (coarse) model in order to accelerate an expensive high fidelity (fine) model. A space-mapping function is defined that maps the interface displacement from the fine to the coarse model space using coarse residual evaluations. The space-mapping function is used to reformulate the fine residual minimization problem such that a faster convergence is expected when a Quasi-Newton method is used for the approximation of the space-mapping Jacobian. The recently introduced Quasi-Newton Inverse Least Squares method is used for this purpose. The space-mapping algorithm is applied to several academic problems to demonstrate its performance. Abstract: The performance of any physical system under consideration is defined in terms of some measurable quantities. These measurable quantities are the system response functions which can be modified by changing some of the system parameters. Since these parameters are selected as optimization variables and updated during the optimization process, they are called design parameters. With design optimization, values of the design parameters satisfing the design specifications is determined. Modeling aims to obtain a system which produces responses as approximate as physical system. Usually a model of the physical system is utilized in simulations to optimize the system. The model on which optimization is to be performed is typically accurate, computationally expensive and non-linear and it is called fine model. Another model approximating the same systemas the fine model approximates is called coarse model and it is typically simpler, having less computational burden (cheaper) and but it is less accurate, and probably it is non-linear. Applying traditional optimization method directly on the fine model would result in a large number of function evaluations, and is considered impossible in practice due to long computation time required. The target is to lower the number of time-consuming fine model evaluations. Surrogate based modeling and optimization techniques provide practical solutions in this respect. In the surrogate based modeling and optimization, the coarse model is used as a surrogate for the fine model. The optimization is performed on the coarse model, and only a few well targeted evaluations of the fine model are needed. Hence the overall computational effort needed is less than that for direct optimization. In Space Mapping (SM) technique, this is provided through a mathematical link (P) from the parameter space of the fine model (xf) to the parameter space of the coarse model (xc) without changing the structure of coarse model. The parameter mapping roughly establishes fitting the coarse model to the fine model evaluated in a given set of fine model parameters. In the prior knowledge input with difference (PKI-D) technique, difference mapping concept is embedded in SM modeling and optimization. This technique is different from classical mapping in SM such that additional inputs (fine model response) are used besides (xf) and output of the mapping is the difference between (xc) and (xf). This difference mapping (Pd) is constructed with similar mechanism used in SM. This difference mapping facilitates input and output based stopping conditions simultaneously unlike SM based algorithms. Novel optimization techniques, space mapping with difference (SM-D) and space mapping with inverse difference (SM-ID) are developed furthermore using (Pd). Moreover SM-ID utilizes inverse mapping(iPd) and inverse coarse model instead of parameter extraction. These novel techniques based on difference mapping provide efficient convergence during optimization process. Difference mapping also reduces the effect of coarse model used on convergence and provides better optimum solution. The difference mapping do not require more computational effort than classical mapping, so this new approach can be applied in other SM based techniques. In this talk, the difference mapping will be introduced and compared to other techniques. Its efficiency will be shown solving problems like impedance and shape reconstruction in noisy and noiseless case of inverse scattering problem, modeling of transmission-line and design optimization. Abstract: Space Mapping (SM) Based Techniques produce alternative ways to solve optimization and modeling problems. Especially, SM based optimization techniques are computationally efficient and involve less computational burden than conventional optimization techniques [1,2]. SM based optimization establishes a mathematical link from fine model parameter space to coarse model parameter space. This mapping improves each iteration step depending on parameter extraction process. Parameter extraction is a process to obtain coarse model parameters from coarse model response where coarse model response is equal to fine model response. Thus, the coarse model parameters obtained correspond to fine model parameters. Parameter extraction directly affects convergence of SM based algorithms and is critical for all SM based algorithms. As parameter extraction involves an optimization process, instead a coarse model obtained from input-output data can be used to avoid computational burden. In this work, SM based optimization will be utilized to solve inverse scattering problem. Inverse problems are naturally hard to solve with conventional approaches due to their ill-posed nature. Sometimes, coarse model cannot be available to be used in SM based techniques for inverse problems. Especially, when inverse coarse model is needed to be used instead of parameter extraction process, it can be obtained with Artificial Neural Network (ANN) structure. Once ANN is trained with limited number of fine model data, it can be used in SM based algorithms during optimization without any training. Space mapping with Inverse Difference (SM-ID)  is newly developed to solve inverse problems through inverse mapping and inverse coarse model, thus provides efficient accuracy and fast convergence compared with other SM based techniques. The direct scattering problems investigate the scattering fields for a given object and source. On the other hand, the aim of inverse scattering problems is to find out the properties of an object, such as shape, electromagnetic parameters. As the scattered fields can only be measured in a limited region of the space, solution of the inverse scattering problems is inherently ill-posed and it requires regularization and time consuming iterative algorithms. On the other hand, if a direct scattering problem is solved using any analytical or numerical method for a plenty of different situations, the data obtained can be used for training the artificial neural network (ANN). Recently, ANN based approaches have been used in electromagnetic inverse problems for finding geometric and electromagnetic parameters of the object under investigation [4,5]. It is also observed that reconstructions obtained by space mapping based technique are better than those obtained by artificial neural network for exact and noisy data. Sharp cornered tetragonal contour is also investigated for both noisy and noiseless case in order to show efficiency of the technique . M.H. Bakr, J. Bandler, K. Madsen, and J. Sondergaard, “An introduction to the space mapping technique,” Optimization and Engineering, no. 2, pp. 369–384, 2001. J. W. Bandler, Q. S. Cheng, S. A. Dakroury, A. S. Mohamed, M. H. Bakr, K. Madsen, and J. Sondergaard, “Space mapping : The state of the art,” IEEE Transactions on Microwave Theory and Techniques, vol. 52, no. 1, pp. 337–361, Jan 2004. M. Simsek and N. S. Sengor, “Solving inverse problems by space mapping with inverse difference method,” in Scientific Computing in Electrical Engineering SCEE 2008, Mathematics in Industry, J. Roos and L. R. J. Costa, Eds., vol. 14. Heidelberg, Berlin: Springer-Verlag, 2010, pp. 453–460. C. Christodoulou and M. Georgiopoulos, Applications of Neural Networks in Electromagnetics. Artech House, 2001. I. Rekanos, “Neural-network-based inverse-scattering technique for online microwave medical imaging,” IEEE Transaction on Magnetics, vol. 38, pp. 1061–1064, Mar. 2002. M. Simsek, N. S. Tezel. The reconstruction of shape and impedance exploiting space mapping with inverse difference method, IEEE Antenna and Propagation,vol.60 No.4, 2012. Abstract: In parameter estimation and calibration of climate models, the underlying models are usual very time-consuming to simulate. Since optimization normally requires a huge number of simulation steps, there is a high desire to accelerate the optimization process. This can be achieved by speeding up both the simulation algorithm itself as well as the applied numerical optimization methods. In this talk we present how the simulation of time-dependent 3-D marine ecosystem models can be accelerated by using GPU hardware. We moreover present two methods for efficient numerical optimization: One is based on a surrogate approach, the other uses a special one-shot method that breaks up the usual loop of simulation - gradient/adjoint computation - parameter update. Abstract: Structural Health Monitoring (SHM) of civil infrastructure often depends on algorithms which detect changes with time in measured data. However, such algorithms can be susceptible to raise false alarms if the structure changes as the result of benign operational or environmental variations. In the case of a bridge, such variations are often caused by temperature effects or traffic loading. One approach to alleviate this problem is to model the effects of the latent (environmental and operational) variables on the measured quantities and subtract them out before change detection algorithms are applied. Recently, it has been shown that Gaussian Process (GP) models are an effective means of developing appropriate surrogate models. However, the GP approach runs into difficulties if changes in the latent variables cause the structure of interest to abruptly switch between regimes. A good example here is given by the Z24 Bridge in Switzerland which completely changed its dynamical behaviour when it cooled below zero Centigrade as the asphalt of the deck froze. The solution proposed here is to adopt the recently proposed Gaussian Process Regression Tree (GPRT) as an alternative. The approach is illustrated here on data from the Z24 bridge and from the Tamar Bridge in the UK which also shows switching behaviour in certain dynamical characteristics. Abstract: In almost all optimization algorithms, a fine balance between local exploitation and global exploration is needed. However, this balance depends not only on the algorithm used but also on the problem type to be solved. Any potentially optimal balance can thus be landscape-dependent and/or algorithm-dependent. For a given problem, to find the most efficient algorithm is a challenging task which is, in fact, an optimization problem itself. On the other hand, for a given algorithm, to find its most suitable problem types that can be solved most efficiently is an equally challenging task. The latter requires a wider range of extensive studies and simulations, while the former often has no satisfactory answer at all. In this paper, we attempt to distinguish two different types of optimality: landscape-based optimality and algorithm-based optimality. We found that for multimodal problems, more time (about 80% of the search effort) should be spent on global exploration, while, for unimodal problems, more time should be focused on local exploitation. We will also investigate the techniques to detect the modes of the problem of interest during initial iterations, and discuss their implications for the choice of algorithms. Abstract: Because engineering optimization problems usually contain multifaceted performance requirements that can be riddled with unquantifiable specifications, for any model, it is generally preferable to formulate several quantifiably good alternatives that provide fundamentally different perspectives to the specific problem. This modelling to generate-alternatives (MGA) solution approach has been employed in several complex engineering optimization applications. This presentation demonstrates how biologically-inspired MGA algorithms can be made more computationally efficient in creating demonstrably good, maximally different solution alternatives. The efficiency of these approaches is demonstrated via a number of computational studies. Abstract: Metamodeling approach has been applied in multidisciplinary design optimization problems to release high computational cost on FEM and CFD analysis. However, the curse of dimension prevents it from further success in case of a large number of design variables. By taking into consideration of the physical-mathematical structure of the system equations, the traditional metamodeling methods, for example, Kriging can be used more efficiently. Here the consideration of physical-mathematical structure means: (1) the design variables and responses for Kriging are transformations of those of the system equations, so that more direct relations are handled by Kriging. Such adjustment is based on the characters of the physical system, which enables the reduction of design space as well as the need of a smaller number of experiments; (2) the regression and the correlation functions of Kriging are optimized to be best adapted to the input-output relations. Such improvements further reduce the number of experiments and increase the metamodeling accuracy, thus facilitate an efficient multidisciplinary design optimization. Abstract: This talk presents a summary of space mapping optimization application for the design of microwave devices used in satellite systems. Output multiplexers and switches are essential components of satellite systems. They are considered large scale microwave devices since they have a large number of parameters and they are very time consuming to simulate by electromagnetic simulators. Finite element EM based simulators and space-mapping optimization are combined to produce an accurate design for T-switches and manifold-coupled output multiplexers with dielectric resonator (DR) loaded filters. Finite element EM based simulators are used as a fine model of each multiplexer channel and a coupling matrix representation is used as a coarse model. Fine details such as tuning screws are included in the fine model. Space mapping optimization has been used to design large-scale output multiplexers and it has significantly reduced the overall tuning time compared to traditional techniques. A multiple space-mapping optimization algorithm has been developed for T-switch design. 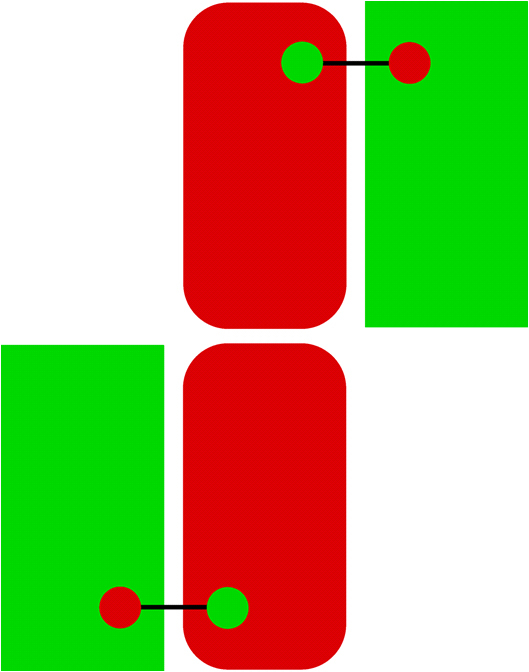 The T-switch has six paths and because of symmetry can be designed by considering only two paths. Applying space-mapping to each path does not produce feasible results since the two paths share some common design parameters. A multiple space-mapping algorithm iteratively enhances the coarse model of each path. The enhanced coarse models are then optimized to meet the required specifications. Excellent RF performance in the C-band and Ku-band has been obtained in few iterations.